Did you know that one hundred years ago, on 13 October 1915, the Niue Contingent of 150 men left their island to travel to New Zealand and join the war effort? To mark the centenary, the whole island will commemorate the departure of their men and the sacrifices they made. Detail of portrait of No 4 Platoon (Niue) 3rd Maori Reinforcements. Image courtesy of Alexander Turnbull Library, Ref: 1/2-042997-F.
Niue lies alone in the vast Pacific. Annexed to New Zealand in 1901, the island had only intermittent contact with the outside world for there was no radio link and shipping was sporadic due to the isolation and lack of harbouring. Over the summer cyclone season there was no shipping to the island. News that the world was at war reached Niue five weeks after hostilities began. A vessel arrived in September 1914 bringing newspapers and mail to the small European population. News of war soon spread and within 24 hours, while the ship unloaded, money was collected to contribute to the NZ Red Cross and an offer of troops was made. To King George V, all those in authority and the brave men who fight. I am the island of Niue, a small child that stands up to help the Kingdom of King George. There are two portions. We are offering 1. Money, 2. Men. – Togia, Patuiki (King) of Niue, September 1914. Although Niue was a New Zealand Island Territory, Niueans felt very close to the British Crown, thanks mainly to over fifty years of teaching by the London Missionary Society. 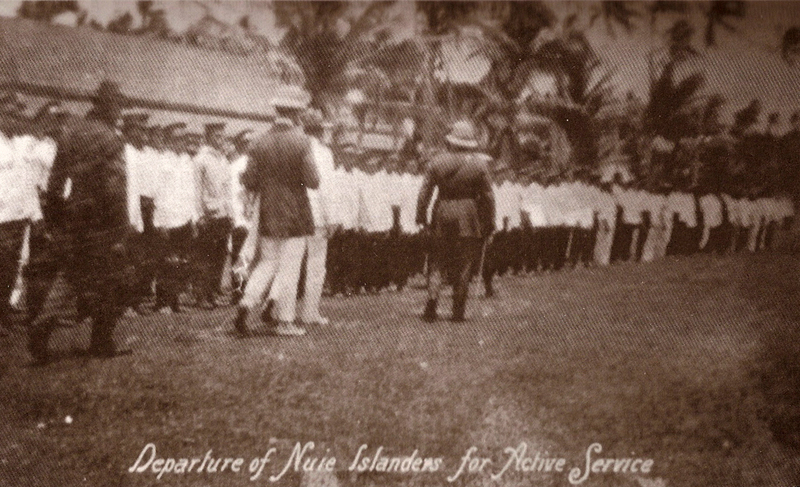 When the vessel left with the money and the offer of troops, arrangements were made to recruit Islanders into what was named the Niue Contingent. The police chief was given the task of organising the recruitment and training the men. Around 200 were selected and were drilled on the village greens in Alofi and Hakupu. There were no uniforms or equipment, certainly no weaponry. Apart from the regular marching practice, life carried on as usual on the small pacific island. The resident missionary on Niue commented in a letter that it was fully expected the offer of men would not be accepted. It was therefore with considerable surprise that a year after Togia’s offer was sent to Wellington, a vessel arrived with news that the Niue men were soon to be taken to New Zealand for training prior to embarkation for Egypt. A troopship was due in early October to carry them to Auckland. A rare photograph of the Niuean soldiers lining up before their departure. Image courtesy of Huanaki Museum, Niue. The key person behind the sudden acceptance of the Niue men was the Member of Parliament for Western Maori, Dr Māui Pōmare. Finding it increasingly difficult to obtain reinforcements for the Maori Contingent following their losses at Gallipoli, Pōmare now used his position as Minister for the Cook and Other Islands to obtain recruits from the Pacific. Offers received a year earlier from Niue and the Cook Islands were now both accepted and Dr Pōmare set out himself on S.S. Te Anau to accompany the Niuean men to Auckland. When, on 12 October, a ship was spotted on the horizon word went out around Niue that the men who had been selected for service, and declared medically fit, should now proceed to Alofi. In the villages farewell feasts were held and in the early hours of 13 October 1915, the men and their families all set out for Alofi. Some were on horseback or on bicycles but the majority walked. They were wearing their church clothes, their ‘best’, and they assembled on the green in Alofi around the large church. When they looked seaward, there was the Te Anau waiting in the Bay. The men paraded on the green and were inspected by Minister Pōmare. A farewell church service was held, attended by the minister, the ship’s captain and officers, the New Zealand resident commissioner and as many Niueans as could fit in the church. Others clustered round outside, seated in family groups on the grass. Following the service each of the 150 men accepted for service was presented with a copy of the Niuean New Testament, a somewhat cumbersome volume, but there was nothing smaller and the book was to be of considerable solace to men later when they were isolated, ill and afraid. There was more feasting, singing and speechmaking. The time for departure had arrived. The tendering boats began rowing groups of men out to the troopship, watched by a large crowd clustered on the clifftops around the tiny wharf. By 6pm they were all on board and the ship departed. What was it like for the families watching from the clifftops? For the family from Hikutavake who sent four sons and later lost two? For the seventy three wives who farewelled their husbands, for the many children who watched their fathers leave? Out of a total population of 3800, 150 of the strongest men had gone. Who could comprehend the enormity of the voyage these Pacific men were about to undertake? A group portrait of No 4 Platoon (Niue) 3rd Maori Reinforcements, by P J Gordon. Image courtesy of the Alexander Turnbull Library, Ref: 1/2-042997-F.
After a six-day voyage in very rough seas the Te Anau arrived in Auckland, docking at Devonport. Some of the Niueans had already completed labour contracts in the Pacific but for many it was their first time off the island. The newspaper reports noted their wonder at all the new sights, ‘the ferry boats and motor-buses’, the buildings and verandahs. Narrow Neck, or Nalo Neke as it soon became known to the Niueans, was one of the camps hastily constructed after the outbreak of war to train reinforcements before sending them overseas. As military camps went, it was very small, being built to hold only 400 men, specifically the Tunnelling Company and the Maori reinforcements. The Niueans, and Cook Islanders, were fortunate to be trained here so they were not overwhelmed by sheer numbers. 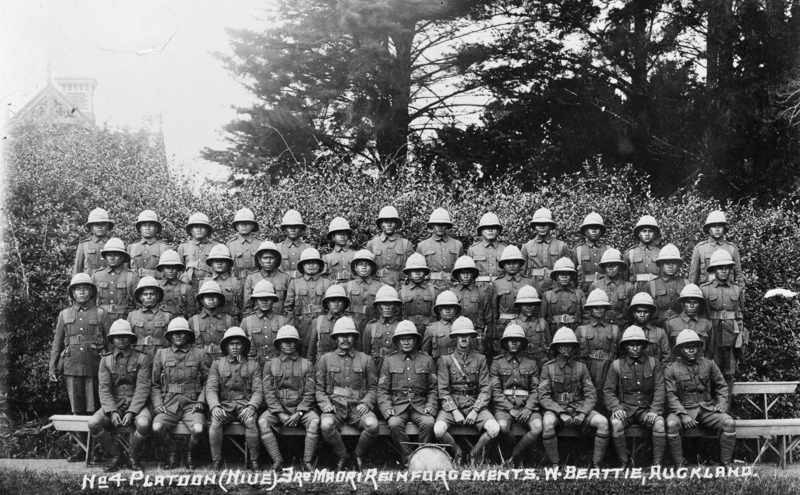 Niuean soldiers while in training at Auckland's Narrow Neck Camp. The soldier left of centre has removed one of his shoes. Wearing shoes and boots was agonising for the Niueans, who went barefooted over a their island's landscape of old coral and were unused to footwear. Image courtesy of the Sir George Grey Special Collections, Auckland Libraries, reference: 7-A14272. Nevertheless, problems soon became apparent. Many of the men spoke no English. They learnt fast but language was to be an isolating factor for these men throughout their army experience. Uniform was another problem. The clothing was uncomfortable but a much greater problem was the footwear. Used to going barefooted, the Niueans found it agonising wearing army boots. The food, especially the meat, caused illness and so did the climate. Isolation in the vast Pacific meant Niueans had little immunity to European diseases and in December 1915 the first death occurred from pneumonia. Despite the problems, training proceeded and the Pacific Islanders were the centre of much curiosity and interest. The Auckland papers carried articles about them and photos of them training and relaxing at Narrow Neck beach. On 4 February 1916, when the 3rd Maori Reinforcements assembled and marched down Queen Street, 140 of the men from Niue were in their ranks. They stood out in the march past as they were the only ones wearing greatcoats over their uniforms. Auckland in February was not warm enough for them. They now departed on the greatest voyage ever undertaken by Niuean men. Their susceptibility to European diseases would cut short their service in Egypt and France but for now they were part of the great adventure. 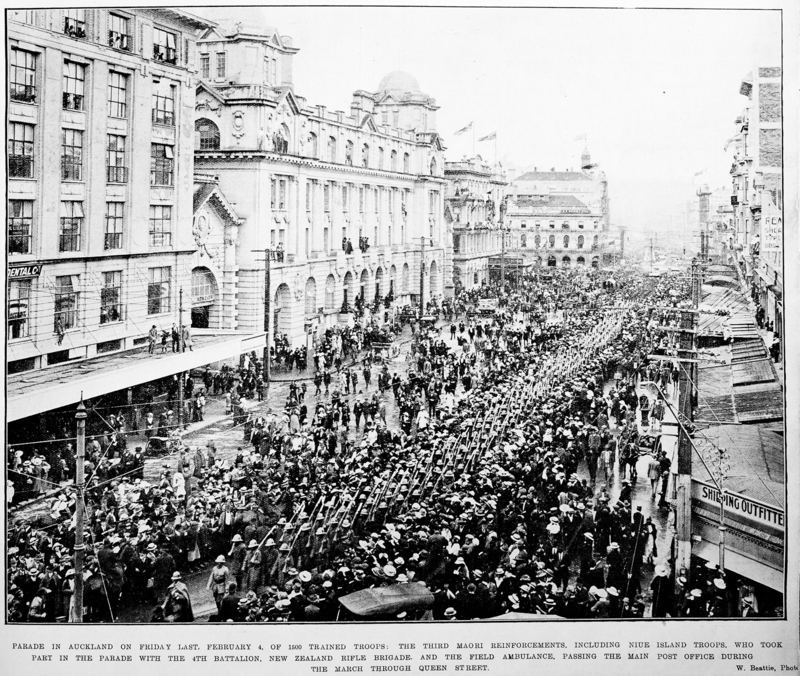 The Niuean troops took part in a march through downtown Auckland alongside the other men of the 3rd Maori Reinforcements on 4 February 1916. Image courtesy of the Sir George Grey Special Collections, Auckland Libraries, reference: AWNS-19160210-35-2.